New Delhi: The Delhi Metro Rail Corporation (DMRC) today erected the last girder of the Noida – Greater Noida Corridor in the presence of Dr. Mangu Singh, MD/ DMRC, Shri Alok Tandon, MD / NMRC and CEO Noida Authority and other senior DMRC and NMRC officials. With the erection of this Girder, the viaduct of this approx. 30 km long corridor has been completed. The Civil Work on this corridor began in May 2015 and the first girder was launched in December 2015 and within a span of 22 months DMRC has erected a total of 2830 Girders (2035 U- Girders and 795 I – Girders). This last U- girder was launched today between Sector 143 and Sector 144 stations of the corridor. DMRC had successfully executed the task of erecting 200 U-Girders on the Noida – Greater Noida corridor in the month of May 2016. . This is the maximum number of U-girders ever launched in any Metro corridor in India within a month. 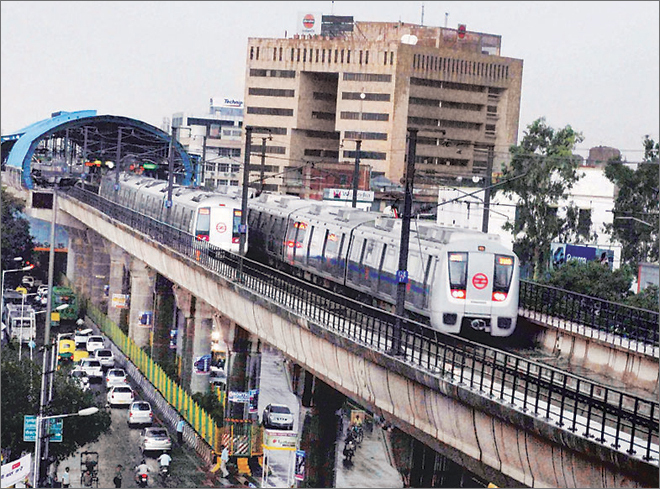 DMRC used six special trailers to transport the girders and six special cranes of around 350/400 Tonnes capacity to launch the 27 mts long and 5.05 mts wide U-Girders. DMRC had also entered the prestigious Limca Book of Records for this feat and Dr. Mangu Singh was formally handed over the Certificate from the Limca Book of Records on 2nd March 2017. The viaduct on the NOIDA – Greater NOIDA corridor was constructed by specialised technique of pre-cast pier caps and precast U-girders. The main challenge of girders is precision in casting as well as launching which required specialised cranes of 350/400 tons capacity to launch these girders. Also, the transportation of girders from the casting yards to the site was another challenge because of its length and width. Accordingly, specialised trailers were mobilised for transporting these girders. All the Girders were pre fabricated at the two Casting Yards located in Noida Sector 149 and Depot Station in Greater Noida, and each weighed approx. 153 Tonnes. The Noida–Greater Noida corridor is approx. 30km completely elevated corridor having 21 stations. This corridor is on Standard Gauge and is crossing beneath the Dedicated Railway Freight Corridor. It is also crossing above the Yamuna – Agra Flyover at 21 mts. which is the highest point of the corridor near the Knowledge Park – II metro station. All stations of this corridor will have Platform Screen Doors, Water Harvesting Facility and Solar Panels. The first set of trains has left China and is expected to arrive at the Greater Noida Depot by mid – December 2017. The entire corridor had lots of challenges like shifting of 400 KV overhead transmission lines, Hindon Bridge, Irrigation drain ands and shifting of other utilities like water lines, gas pipeline, sewers, cables, etc. This project has been executed by DMRC on behalf of Noida Metro Rail Corporation (NMRC) Ltd. through its civil contractors Continental Engineering Corporation & SAM India Builtwell Pvt. Ltd. Joint Venture along with Design support from Systra, Ayesa and TCPL.